According to Press TV quoting the US State Department, Stephen Biegun, the US Special Representative for the North, is to arrive in the South’s capital, Seoul, on Wednesday afternoon. The South Korean Foreign Ministry said Biegun would on Friday attend a meeting of the South Korea-US working group on North Korea, which was established last month to work toward the demilitarization of the South-North border. “Close discussion over various pending issues related to the North Korean nuclear issue… including inter-Korean relations will (also) be held,” the ministry added. 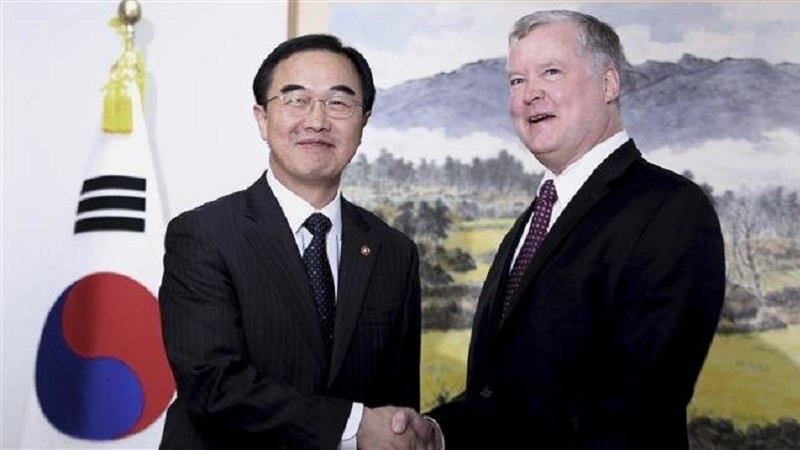 The US envoy is scheduled to hold talks on Thursday with his South Korean counterpart, Lee Do-hoon. He will also meet Unification Minister Cho Myoung-gyon on Friday. It is unclear if Biegun will be meeting with any officials from the North. It was previously said that Head of the CIA’s Korea Mission Center Andrew Kim was scheduled to secretly meet with North Korean officials at the truce village of Panmunjom in the Demilitarized Zone (DMZ). US President Donald Trump met with North Korean Leader Kim Jong-un in Singapore earlier this year, when the two agreed to work toward demilitarization. Subsequent diplomacy between Washington and Pyongyang has, however, made little progress in recent months, mainly because the US refuses to lift harsh sanctions on the North. The North has taken several steps toward denuclearization; it has suspended missile and nuclear testing, demolished at least one nuclear test site, and agreed to allow international inspectors into a missile engine test facility and another nuclear testing site. A planned meeting between US Secretary of State Mike Pompeo and senior North Korean official Kim Yong-chol was abruptly canceled in November. The two sides have yet to reschedule a meeting. Nevertheless, there has been talk of a second Trump-Kim meeting for early next year. Trump’s National Security Adviser John Bolton has said the president wants to hold the second summit with Kim because the first has yielded no progress. Meanwhile, South Korea has advanced its relations with North far more since a sudden rapprochement began between the two neighbors — which had been adversaries for decades — in January.